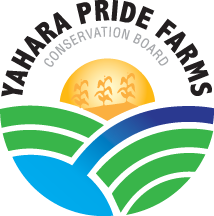 Thursday, November 12 marked the first Yahara Pride Farms (YPF) informational composting demonstration event. The purpose of the event was to showcase the economic and environmental benefits of manure composting. In the early afternoon, 16 area farmers and six others involved in the manure composting trial gathered in the northern part of the Yahara watershed at Endres Berryridge Farms. This location is one of three manure composting trial sites in the northern part of the Yahara watershed. Maier Farms and Hoffman Farms are the two other farms participating in the composting trial funded by SARE. The event kicked-off with an overview of the project. Andy Skwor of MSA Professional Services presented an on-farm composting factsheet and explained the temperature chart he developed that exhibited the progress of the composting piles at the three farm locations based on temperature. He explained that when using the windrow compost method, it is required that the windrow maintains a temperature of 131 degrees Fahrenheit for at least 15 non-consecutive days. Of the total peak days, the windrow must be turned on five of those days. The data collected from the three farms showed a promising future based on the recorded temperatures. One of the manure compost windrows event attendees had the opportunity of seeing. Next, Jacob Getz of Insight FS explained the nutrient benefits that the compost windrows provide based on data from a manure analysis and nitrate report. Through out the discussion, many farmers were engaged and asked questions regarding the economical benefits. 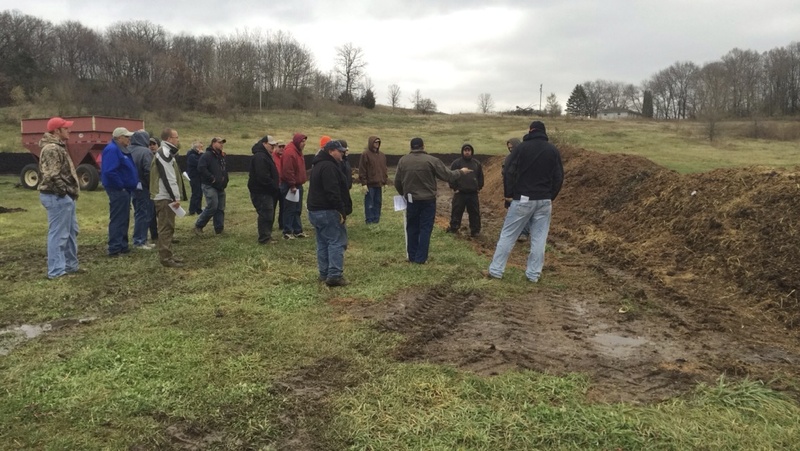 After the compost trial overview, the attendees toured the four on-site compost windrows. 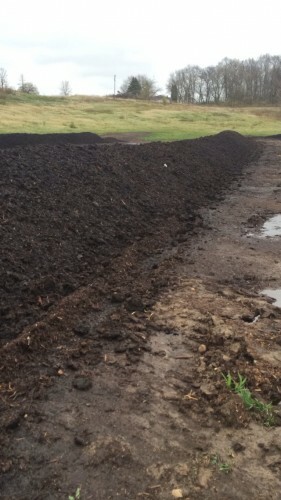 The windrows ranged from the beginning of the composting process, where the windrow still exhibited elements of solid manure bedding pack, to the finishing stage, where the windrow components had been digested into even particles that resembled black soil. To wrap of the event, Jason Fuller, who helps manage the compost piles on all three sites, demonstrated the turning of one of the compost windrows. In addition to showing and explaining the compost turning process, Fuller finished by talking about the Tebbe compost spreader that includes a scales and spreading width of up to 100 feet. Post event, the group gathered for a late lunch at the farm where attendees had the opportunity to catch-up and ask any lingering questions. There will be continuous communication with the farms who attended on future composting opportunities. A full report on the composting trial will be available at the March YPF meeting.